This will be just a quick post because I'm so busy today. But wanted to show you my new nail polish that I bought on Tuesday. I'm so into orange and bright colors right now so looking at my bright orange nails makes me really happy. And with the sun shining like crazy this days it makes it even better. Sorry for the really bad quality of the pictures but didn't have my camera with me and I took them with my phone and the colors looks brighter in real life. 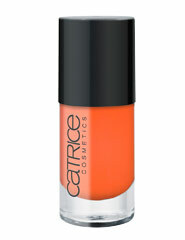 It's from Catrice and the color is called MAN Go Tango! Haha what a great name. I'm currently in love with this brand, and I've almost bought every color they've got. They have amazing colors and pretty good quality (they are not the best quality but it's good, it lasts for 2 or 3 days). And on the most of them you can only apply one coating. And the best thing is that the bottle is big and the price is so cheap only 2,50€! I was thinking about getting a yellow one too? What do you think? Oh and here is their website if you wanna see all the colors Catrice. Love the colour!! It's so fresh! !